You will find heated pools, outdoor whirlpools, and underwater music, but the main attraction consists of three outdoor pools in the shape of basins. In addition to the pools, the center also boasts a sauna area of 2000 square meters where you can indulge in treatments such as hay baths. The center is complemented by a special area dedicated to children and their families. Sports enthusiasts will have fun in all seasons thanks to the hundreds of miles of trails which during the winter are transformed into ski slopes, in the ski areas of Sölden –Oetztal and Obergurgl-Hochgurgl. In addition to the paths, there are two railroads and a Nordic fitness park. 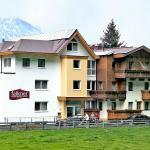 The Top Tirol Appartement is located in the Ötztal valley, in the beautiful Tyrolean region. 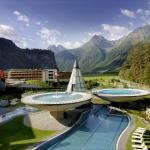 A short distance away there is the Aqua Dome spa and the renowned tourist winter destination of Sölden. The Aqua Dome 4 Sterne Superior Hotel & Tirol Therme Längenfeld is a luxury 4 star hotel located in Längenfeld, in the beautiful setting of Ötztal Alps, not far from the only thermal area in western Austria. Hotel Zum Hirschen is located in a historic building dating back to 1590 in the centre of Längenfeld, 200 meters from the Aqua Dome spa. 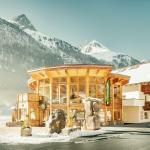 The Gasthof Schöpf, cozy 3-star family-run hotel, rises in Gries, in a sunny area in the valley of Ötztal. The structure, in alpine style, features a spa area. 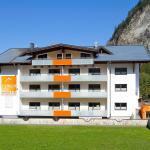 Recently renewed, the Burgstein Aparthotel is located in the Ötztal valley, in a quiet and sunny position. The Pension Tannenhof, surrounded by the Tyrolean Alps, is located in Längenfeld, in the valley of Ötztal. The free ski bus stops near the hotel.